Last month for Thursday Throwdown, we covered the 4 Elements of a Legendary Marriage with Lance Salazar. Over 4 weeks, he broke it down into: The Individual, The Partnership, Becoming Friends, and Becoming Lovers. Today I’m going to talk about the marriage partnership in action. I applied a quasi business-like approach to working with my wife to make sure we were on the same page when it came to responsibilities. This included a weekly meeting where we “frontloaded” and planned everything in advance, from who was taking the kids to school to what we were having for dinner. We even synchronized our schedule in a Google calendar. Is it worth doing all this tedious planning? How does it benefit our marriage? Don’t forget to catch up with the other episodes in this series! 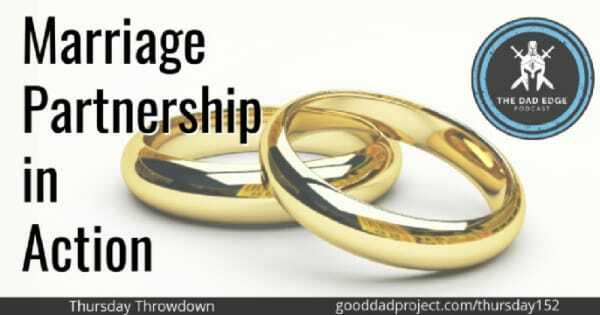 The post Marriage Partnership in Action appeared first on The Good Men Project.